The Very First Easter – A book that explains the true meaning of Easter with colorful illustrations of the resurrection of Christ. 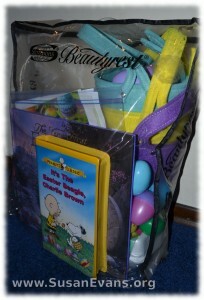 Plastic Easter eggs and stackable baskets for each child for the Easter egg hunt each year. Unused egg dye kits and wire egg holders left over from other kits so that each child has a wire egg holder to dye their Easter eggs. A plastic bag or decorated folder with clipped magazine pictures for Easter crafts you might want to do with your children in future years. Cut off the top part of a cardboard egg carton. Put candy or the Resurrection Egg items into each compartment. Glue colorful squares of tissue paper to seal each compartment. With a black marker, write the numbers 1-12 on each piece of tissue paper before you glue it in place. Allow it to dry overnight. 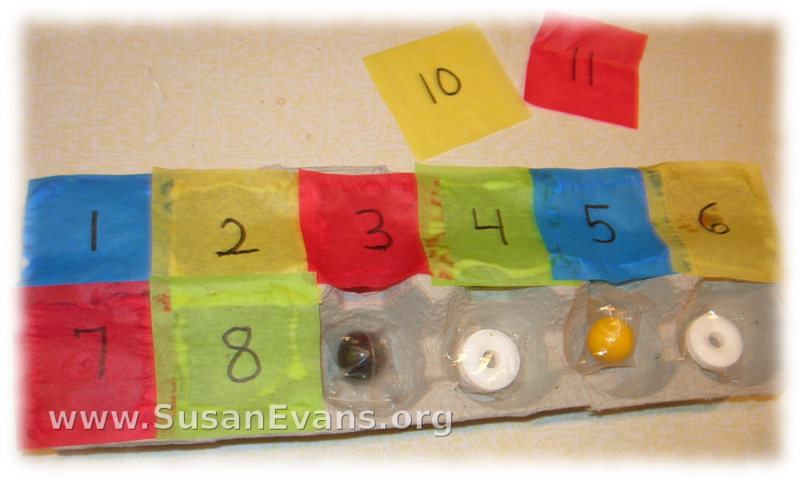 For the 12 days before Easter, your kids can tear through one number of the tissue paper, getting the candy or item, looking forward to Easter. This is sort of like an Advent calendar, except it’s for Easter instead of Christmas. Scrunch down a paper sack to make the nest. Pour glue over the top. 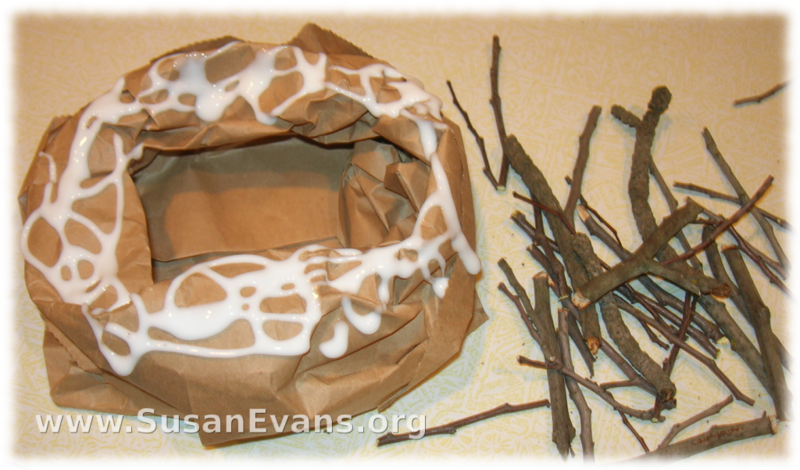 Have your kids glue the small twigs onto the paper sack. Super cute nest, perfect for your glitter eggs. 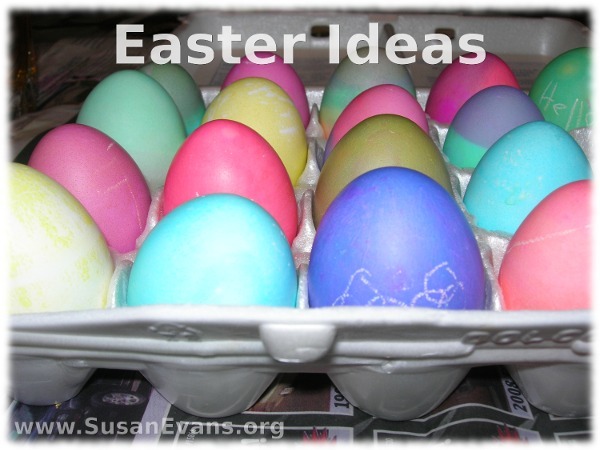 Place the egg into a plastic bag with confetti. Shake the egg to coat it completely. Let the beautiful glitter egg dry in the fridge. Place it into the cute twig nest the next day. This entry was posted on Tuesday, April 19th, 2011 at 7:37 am	and is filed under Fun Spring Activities. You can follow any responses to this entry through the RSS 2.0 feed. You can skip to the end and leave a response. Pinging is currently not allowed. YOU are just darling. Now, now, dear gotta cut back on the coffee. Loved your ideas, even the “dorky” ones. You are awesome!